Well, it's press conference day here at E3 2013, and we've just returned from our morning adventures, so it's time to recap what we saw, speculate about what might have co-op, and for me personally, geek out about a returning franchise. After Peter Moore warmed up the crowd a bit, the show got started in a pretty surprising way - with the announcement of Plants vs. Zombies: Garden Warfare, a third-person shooter with four-player co-op. Players take control of the Peashooter, Sunflower, Cactus, and Chomper to fend off waves of zombies, planting extra plants in pots littered around the level. It reminded us an awful lot of Dungeon Defenders, and that's a good thing. Following that, PopCap announced that we'd be seeing Peggle 2 this year, punctuated by the familiar strain from Ode to Joy. Next up, we got our second taste of Respawn Games' Titanfall for the day. Titanfall is a multiplayer shooter that looks to blend all aspects of the genre. Players fight for control of "hardpoints" and seem to be rather agile, equipped with jetpacks and the ability to wallrun. Your team can also deploy Titans, which are giant exoskeletons you can hop into and unload some serious firepower. Single player and multiplayer are blended together, and you'll get bursts of story and flavor dialogue on missions from NPCs. We were reminded heavily of Brink, but this seems to go a step beyond, and looked real fun. The first tease of the day was a reveal that DICE is indeed working on a new entry in the Star Wars Battlefront series. I could sense Co-Optimus alumni Jim 'Txshurricane' McLaughlin's mind being blown from the Shrine Theater. The next entry in the Need For Speed series, Need for Speed Rivals looks to continue the Police vs. Racers interplay of the past few games, with a new twist: single player, co-op, and competitive multiplayer are all blended together seamlessly. Players can log in with the 'all play' mode, and as their friends come online, they can hop into games as a teammate or a rival. Players on a tablet can join in as "Overwatch" and assist the Police, but the functionality was glossed over in the conference. We saw the first trailer for Dragon Age Inquisition, which didn't show us too much other than that the world is being torn apart by demonic forces and darkspawn, and that Varric and Morrigan will be on hand for the adventure. EA Sports showcased several titles - Madden 25, NBA Live '14, FIFA '14 and EA UFC. All use the new in-house Ignite engine and boast the usual improvements to AI, animation and online. They looked really nice, but nothing of particular substance was shown outside of the new ball physics model for NBA Live. Another repeat from the Microsoft conference was Battlefield 4, except this time we saw the multiplayer mode in all of its glory. 64 players will join up for a sporting round of manshooting, and the destructive environments from BF3 and the Bad Company games have been ramped up quite impressively. One team blew the roof of a parking garage apart, trapping a tank, and later an entire skyscraper was brought down by the fiery wroth of the opposing force. A new commander mode is available to issue orders to your entire team, and can be played by a player on a tablet via Smartglass, or whatever other methods exist for the PS4/PC. The show was wrapped up with something that made me extremely happy: the announcement of a new Mirror's Edge game. 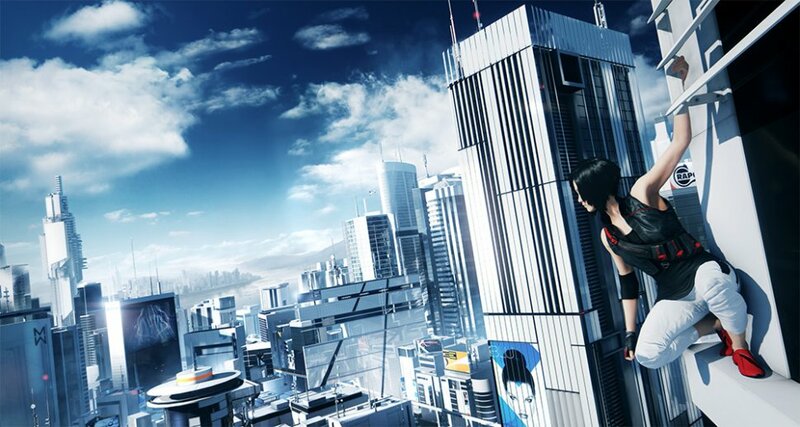 It looks fantastic, I've wanted to see another Mirror's Edge for a long time, so hopefully it'll be worth the wait. Much was made of EA's two new in-house engines, Frostbite 3 and EA Sports Ignite. Everything the studio showed off was running on one of those two engines, and everything shown is slated for Xbox One and PlayStation 4 (and most will likely hit PC as well). We came away fairly impressed by everything we saw, and for my money, Titanfall looks like it'll be something special.